In defiance of Nintendo’s expectations, Pokémon became a worldwide phenomenon when it debuted in the West in 1998. Realizing they had a new, venerable franchise on their hands, they decided to branch out the series as Satoshi Tajiri and the rest of Game Freak devised a sequel. One of their projects was to be called Pocket Monsters 64. True to its name, it would mark the Pokémon franchise’s console debut. Not only that, but because it would debut on the Nintendo 64, the franchise was to jump from its simplistic presentation on the Game Boy and into the third dimension. 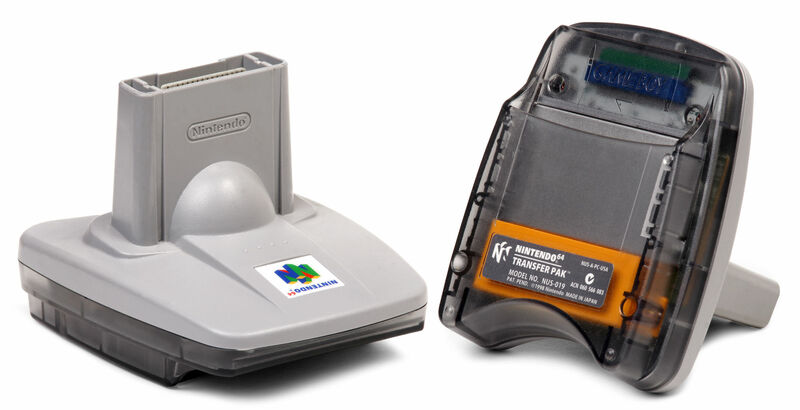 Nintendo even planned to up the ante by having the game debut on the 64DD (Dynamic Drive). This Nintendo 64 peripheral would utilize a new storage media and afford players many freedoms, including the ability to create characters. These plans ultimately fell through when it became clear the 64DD would require much more time to develop. Responsibility of this game’s development ultimately fell on Satoru Iwata of HAL Laboratory. Putting his programming expertise to good use, he and his team converted Pocket Monsters 64 to a standard 32-megabyte cartridge. He ported the games’ unique battle system to work on the Nintendo 64. It took an entire week to read the Game Boy source code. Once that was done, he converted Shigeki Morimoto’s programming to the new console. Due to technical limitations, the final product only contained 42 out of the 151 Pokémon. The fruit of their labor, Pocket Monsters Stadium, was released in August of 1998 whereupon it sold 270,000 copies within its first month. In February of 1999, Nintendo announced a follow-up intuitively named Pocket Monsters Stadium 2. Reception to its unveiling was positive. The original game was criticized for its anomalously high difficulty and several Pokémon being unavailable to use. This prompted Nintendo and HAL to tone down the AI for the sequel. The game saw its domestic release in April of 1999 before debuting internationally the following year. Abroad, the game was retitled Pokémon Stadium due its predecessor having never left its native homeland. It became one of the Nintendo 64’s bestselling titles, moving one-million units before the end of 2000. Did Pokémon Stadium allow the series’ traditional gameplay to make a triumphant entrance to home consoles? Even in the West, Pokémon Stadium isn’t exactly the first Nintendo 64 title to feature Game Freak’s signature creatures. It was preceded by Pokémon Snap in which you were made to photograph Pokémon in the wild. On top of that, the highly popular fighting game Super Smash Bros. featured characters from various Nintendo’s franchise. Among them was Pikachu – the electric mouse Pokémon often seen as the franchise’s mascot. 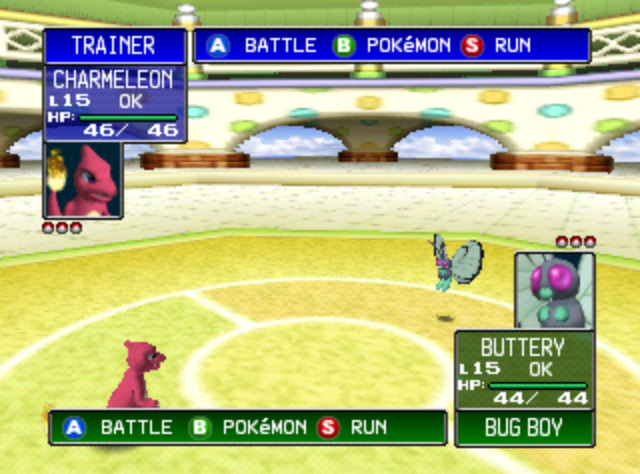 However, as advertised, Pokémon Stadium was the first console game to feature the series’ trademark battle system. Because of this, it would be easy to get the impression that Pokémon Stadium is a role-playing game. This isn’t quite the case; it would be far more accurate to describe Pokémon Stadium as a strategy game with trace role-playing elements. What disqualifies the game from being a true role-playing experience is that there isn’t really a story. You’re simply taking part of a tournament and your goal is to defeat the competition. Such a task seems straightforward enough, but there’s just one problem; you can’t exactly go out and catch Pokémon in this game. Pokémon Stadium is primarily intended for you to battle your monsters against others’. If you don’t have your own Pokémon, you can rent some from a local service, but this seems to defeat the purpose. With no opportunity to capture and train Pokémon, you are left with only one option: train your own elsewhere. This is where Nintendo’s Transfer Pak accessory comes into play. The Nintendo 64’s controller was highly unique for its time in how one could plug memory cartridges called Controller Paks into them. This was quite a contrast from the PlayStation in which players plugged Memory Cards into the console itself. While this sounded like a mere aesthetical choice, Nintendo developed other accessories intended to fit into the controller. One of the most notable ones coincided with the release of Star Fox 64: the Rumble Pak. Vibrating whenever the player character took damage or a large explosion took place, it was one of the first instances of kinesthetic communication in gaming. The Transfer Pak’s purpose, on the other hand, is a bit more complicated. By itself, it does nothing at all. Only by inserting a Game Boy cartridge does its true purpose become clear. Not just any cartridge will do; in order to use the Transfer Pak, you must insert a copy of Pokémon Red, Pokémon Blue, or Pokémon Yellow – the last of which being a rerelease of the original two games more faithful to the accompanying anime series. The point of doing this is what you think; you can use the Pokémon you trained in any of these games to compete in the ultimate tournament. The ability to call upon data from another game dates back to the early 1980s with the Wizardry series. However, as long as both games could be run with the same operating system, writing the code to accomplish this was relatively simple. What Nintendo did with Pokémon Stadium, on the other hand, is a horse of a different color. They successfully engineered a device that allowed two entirely different sets of hardware to interact with each other. Though easy to write off as the kind of out-there innovation Nintendo was known for, the sheer technical knowledge required to conceive such a device is nothing short of incredible. Venturing into the stadium proper reveals that there are actually four different tournaments: the Poké Cup, the Prime Cup, the Pika Cup, and the Petit Cup. All of these tournaments originated in Pokémon Yellow. 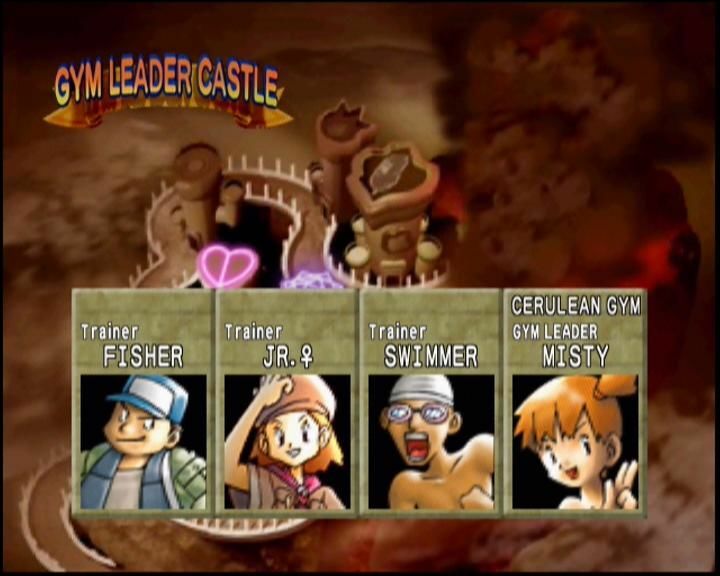 One of its multiplayer modes included a secondary player-versus-player match that drastically limited what Pokémon could be used. Despite the varying conditions, all of the tournaments follow the same basic rules. You are made to fight eight opponents per tournament. Every competitor brings six Pokémon with them, though only three may be used in a given match. Should you prove skilled enough to fell all of your opponent’s Pokémon without having any of your own faint, you will earn a continue. As the Poké Cup is called the Nintendo Cup in Japan, it’s easy to perceive it as the main tournament. It also has the most straightforward rules, which give you a general idea of how the rest of the tournaments operate. In this tournament, only Pokémon between the levels of 50 and 55 can compete. You can’t simply use this as an excuse to send out an entire team of Level 55 Pokémon to decimate the competition. When you select your Pokémon, the sum of their levels cannot exceed 155. This means if you decide to send out your hard-hitting Level 55 Dragonite, the rest of your team can only be Level 50 Pokémon. Alternatively, you can opt to have an entire team of Level 51 Pokémon, though this may leave you at a disadvantage when you lack the muscle to deal with a difficult trainer’s superstar. Plus, the aforementioned Dragonite, which happens to be one of the strongest Pokémon in the game, evolves at Level 55. Indeed, you will find yourself putting much more thought into which Pokémon gets to be on your team than when you were playing the games embedded in the Transfer Paks. The Petit Cup is a bit more complicated. Only Pokémon between the levels of 25 and 30 may compete. Additionally, and true to its name, Pokémon above a certain height and weight are forbidden from entering. Keeping with the spirit of the tournament’s name, any evolved Pokémon are forbidden as well. The Pika Cup pits Pokémon leveled from 15 to 20 against each other. Unlike the Petit Cup, there is no size or evolution restriction, though choosing your team becomes an interesting process when you consider how difficult it is to get a strong, yet low-leveled Pokémon. It is known as the Yellow Cup in Japan, and not coincidentally, many of the strongest Pokémon you can use for this tournament are found in Pokémon Yellow. Lastly, in the Prime Cup, anything goes. There is no level restriction whatsoever, and any Pokémon can compete. This is significant because the most powerful Legendary Pokémon, Mewtwo and Mew, are forbidden in any other tournament. You are not limited to fighting in the titular stadium, however. There is a castle on the edge of town populated by the Kanto Gym Leaders. Each of them is in charge of a fortress within the castle, and your goal is to defeat them. However, just like in Pokémon Red, Blue, and Yellow, their fortresses also have trainers you must defeat to reach them. Every fortress pits you against three standard trainers and a Gym Leader. Though you fight fewer opponents than you do in the stadium, you cannot afford to lose a single time. The town includes many other services as well. Professor Oak has a laboratory stationed in this town, which allows you to transfer and store items and Pokémon on the cartridge. This was of a significant benefit for the player at the time, for it ensured that they could keep their Pokémon between playthroughs. Before the release of this game, their only choice if they had Pokémon they wanted to keep was to buy another cartridge or trade all of them to a friend. Neither solution was ideal, either costing them money they could use to buy a different game or being overly time consuming. While transferring items isn’t as helpful, it was nice to be able to retain TMs and other valuable items between playthroughs. Through a particularly clever use of this mechanic, you could even break the game’s intended sequence. If nothing else, you no longer had to worry about running out of storage space. The only catch is that you have to save in a Pokémon Center to use this service. Also in this town is a Kids Club where you can play one of nine minigames: Magikarp’s Splash, Clefairy Says, Run, Rattata, Run, Snore War, Thundering Dynamo, Sushi-Go-Round, Ekans’ Hoop Hurl, Rock Harden, and Dig! Dig! Dig! The minigames are highly reminiscent of the ones from Mario Party in that they frequently involve quick reflexes and tapping a certain button on the controller repeatedly. They’re simple, but quite a bit of fun to play – especially with a friend. They also allow lend the titular creatures a personality outside of battling when they employ their unique powers to win these competitions. One of the most eye-catching features in this town other than the stadium is the giant Game Boy-shaped edifice on the eastern side. This is the GB Tower, and it does exactly what you would expect; it allows you to play whichever Pokémon cartridge you have in your Transfer Pak. Though it would appear to be a watered-down version of the Super Game Boy accessory for the Super NES, it does have one slight advantage over it. Should you prove tenacious enough to win all four Poké Cup tournaments, you will unlock the Doduo GB Tower. This allows you to double the speed of the gameplay by pressing the right “C” button. Win all four Prime Cup tournaments after having cleared the Poké Cup, and you will unlock the Dodrio GB Tower, which further increases the speed of the game. I have to commend Pokémon Stadium for recreating the battle system that made the original games stand out from their contemporaries. With the three-dimensional presentation, the battles looked amazing. No longer did Pokémon battles look like sprites crashing into each other. The Pokémon would have their own entrance pose, and each individual move had an eye-catching animation. Whenever you won a fight in Pokémon Stadium, there was always far more weight to it. You and your opponents were evenly matched more often than not – a stark contrast to Red, Blue, and Yellow in which the average trainer was practically cannon fodder. Some of the little features were quite novel as well. You could photograph your Pokémon and then take the cartridge to a kiosk at a local video rental store. This kiosk was originally developed to print the photographs you took in Pokémon Snap, and it worked with Pokémon Stadium as well. In an age when one couldn’t easily take screencaps of their playthroughs, this development was highly innovative. Pokémon Yellow was notable in that, like the anime, the player started off with Pikachu as their starter. If you used this one on your team, it would be voiced by Ikue Otani. The biggest downside to having perfectly recreated the Pokémon battle system, however, is that all of the weaknesses thereof carried over as well. Pokémon Red and Blue were not optimized for player-versus-player matches with its creators only implementing the idea at Nintendo’s behest. This fact is painstakingly obvious because those games are horribly balanced – and by extension, so is Pokémon Stadium. Because Psychic-type Pokémon lacked any kind of meaningful weaknesses, all you needed was a particularly powerful one and no one in the game had a reasonable chance against you. Even with Mewtwo banned in most tournaments, this is amazingly easy to accomplish. The primary reason why the problem is far more apparent in Pokémon Stadium is because the battle system is the game’s sole focus. Without the ability to explore dungeons, talk with NPCs, or catch Pokémon in the wild, the lack of balance becomes impossible to ignore. Unsurprisingly, this also makes the game highly repetitive. 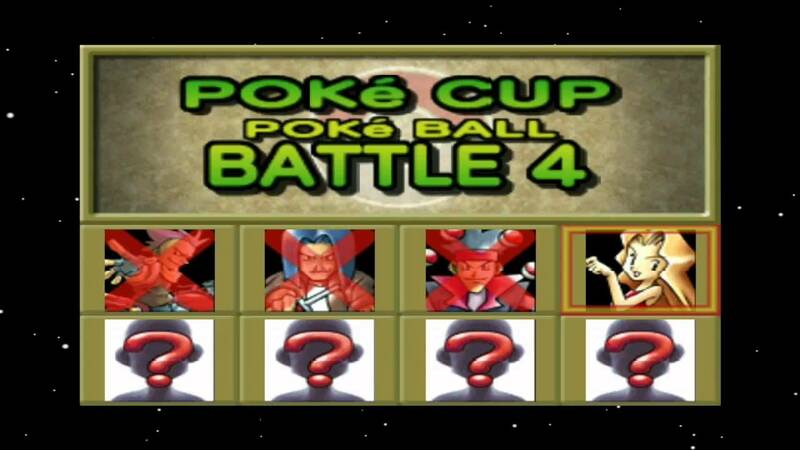 In particular, you need to win the Poké Cup and Prime Cup four times apiece. While the trainers’ lineups do change between difficulty levels, there still isn’t much diversity to be found in what you have to fight. Though these games introduced 151 Pokémon, the evolutionary trees ensures the effective number of opponents you can fight is far below that number. Not helping matters is the game’s speed. Owing to their simplistic graphics, battles in Red, Blue, and Yellow had a reasonable sense of pacing. This isn’t the case with Pokémon Stadium; even incredibly basic moves such as Tackle and Scratch take a long time to fully execute. When you’re using the more powerful ones such as Fire Blast and Hyper Beam, the animations tend to be even longer for dramatic effect. While it certainly looked impressive for its time, it also needlessly draws out a given battle to often absurd degrees. Part of what makes this noticeable is that, unlike in the Game Boy titles, attack animations play out regardless of whether or not the move in question hits its mark. It’s frustrating enough when an attack misses anyway, but not being privy to that information immediately is even worse. What I consider to be the absolute worst aspect of Pokémon Stadium has to do with the level requirements. The Petit Cup, Pika Cup, and Poké Cup aren’t unreasonable in this regard. You can potentially play the original games while training your Pokémon for these tournaments. If you do so, the level restrictions match where your team is likely to be in the first, second, and third act of the game. Even better, you’re allowed to register your team as they are, which means you can keep them at their current levels in Pokémon Stadium while training them in the Game Boy titles. This proposition comes crashing down when you’re made to compete in the Prime Cup, however. This is because every single opponent you fight in the Prime Cup has Level 100 Pokémon. I question why the game would even allow you to enter the tournament when you are putting yourself at a major disadvantage by not having Level 100 Pokémon of your own. More to the point, when you’re nearing the end of Red, Blue, or Yellow, your team’s levels will likely hover around the fifties range. If you want any reasonable chance of winning, you better be prepared to grind levels in the Cerulean Cave for hours on end. A saving grace appears to exist in the form of the rental Pokémon. However, this notion is dashed when you closely examine the Pokémon available for rent and realize they have terrible stats and move pools. Even if one had the option to change them, using the rental Pokémon ultimately misses the point of the game. The game is advertised as the opportunity to use your own Pokémon to compete against tough trainers, so using rentals makes the experience feel hollow. Your reward for clearing all four tournaments and the Gym Leader Castle isn’t particularly impressive either. Once you do, you are made to fight Mewtwo. While this would be fairly challenging if you could only fight it with a single Pokémon, you are allowed to use a full team of six. If you were good enough to have cleared the Prime Cup, this battle is over before it started. Mewtwo may be the most powerful Pokémon in the game, but it means nothing when you have six reasonably strong ones to fight it. In fact, there’s nothing stopping you from sending out your own Mewtwo to fight it. When you defeat Mewtwo, you unlock the game’s second round. You must compete in all of the tournaments once more – the sole difference is that opponents are much more difficult this time around. Though a challenge can be appreciated, this is just blatant padding that only results in the player earning certain Pokémon as rewards, which isn’t as exciting as it sounds. 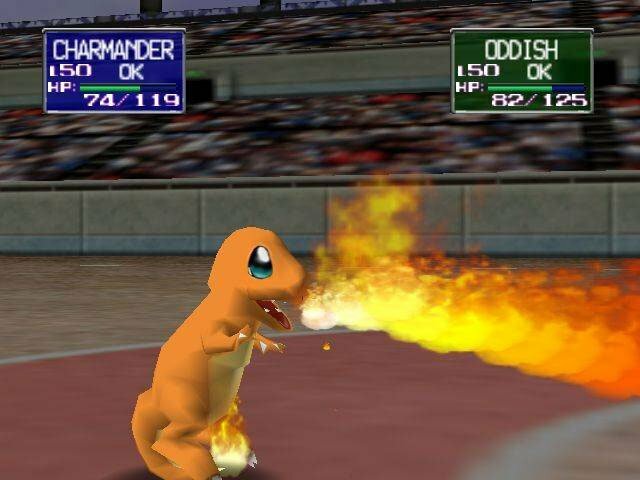 Pokémon Stadium is a prime example of a game that wasn’t built to last. After watching several episodes of the anime, many fans were slightly disappointed by how simplistic the battles looked on the Game Boy. It couldn’t have been helped given the technical limitations, but they seemed significantly less exciting by comparison. Pokémon Stadium offered fans a chance to more closely recreate what they saw in the anime. While it was effectively just a 1:1 translation of the familiar battle system pioneered in Pokémon Red, Blue, and Yellow, fewer things were greater than seeing the Pokémon you raised in those game fight in a three-dimensional arena. Unfortunately, the Achilles’ heel of Pokémon Stadium is that, given the lengths you have to go in order to stand a reasonable chance against the powerful trainers, it is a game you spend more time preparing for than actually playing. It is completely dependent on the player owning a copy of the Red, Blue, or Yellow versions of Pokémon because they will not get anything out of playing it alone. If you were to take the Transfer Pak out of the equation, you would be left with a subpar, poorly balanced strategy game that happens to feature Pokémon. While many of these criticisms couldn’t reasonably be made without the power of hindsight, it still doesn’t change that there is no reason to revisit Pokémon Stadium. In a few years, both the Nintendo 64 and the Game Boy Color were discontinued. 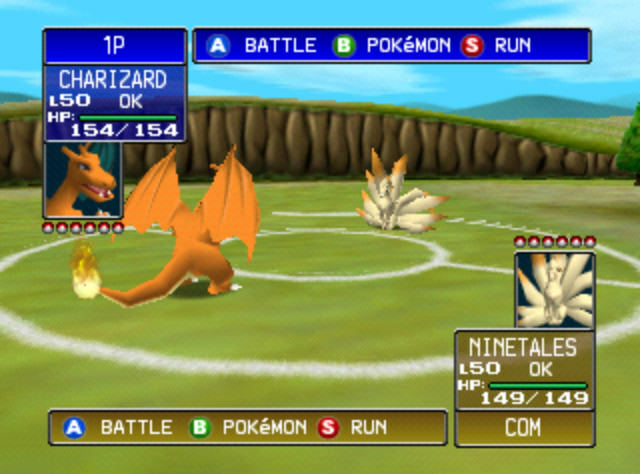 The debut of the third generation of Pokémon was the final nail in the coffin for Pokémon Stadium when players learned, to their dismay, that these new games were incompatible with any previous ones. Even further down the line, the core games adopted a three-dimensional presentation that looked far better than the outdated Nintendo 64, nullifying the negligible advantage it had over the handheld installments. 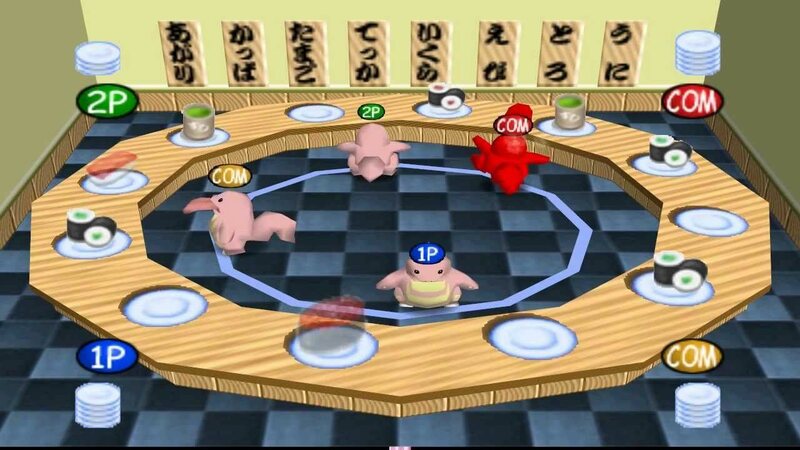 Pokémon Stadium was an interesting experiment in cross-platform compatibility, but playing it as originally intended would be quite difficult and ultimately not worth the effort. Back when my friends and I were younger, we played this a lot but only for the mini games. If we wanted to play Pokemon properly, there were far better options. Yeah, the mini games are the only real thing this game has going for it nowadays, but Mario Party and its two sequels have both better ones and a greater number of them. Very much so. I suppose the fact they have Pokemon in them give them an extra edge at least. I have vague memories of this, but only for the mini-games. I doubt I’ll revisit it anytime soon. There’s not much of a reason to revisit it; if you’re looking for minigames like the ones in this game, Mario Party and its first two sequels are the way to go. I played it quite a lot when I was younger, especially the sequel, but in hindsight there is really not much to the game other than the awesome mini-games and the opportunity to see monsters battle it out in 3-D.
Yeah, and the problem is that Sun and Moon allow your monsters battle it out on 3D in addition to providing a solid campaign, making Stadium even more redundant. 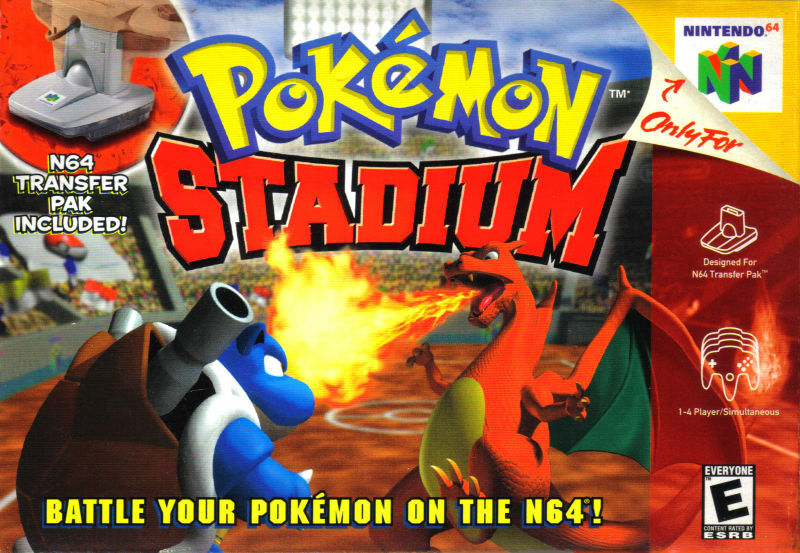 It’s a bit weird because I think of Pokémon Stadium as a game that was legitimately good for about one year before its sequel came out (and then its sequel met the same fate once the series moved on to Gen III). I have a lot of good memories of this game, but there’s no getting around that it’s entirely obsolete. I absolutely agree. But hey, at least the mini-games are still cool. Sounds like, as with most folks here, I remember playing the mini-games with my friends for a while and just having a blast with those. Every so often, we’d play with the stadium portion, but given that neither of us had transfer paks or copies of the GB Pokemon games at the time, the options were fairly limited. Still, definitely agreed that it was a huge step and innovation the way the company handled it. Same here. I actually did play this game with a friend who also had a Transfer Pak, so we got a lot of out this game. Still, there’s not much of a reason to play it now – even if it was very innovative for its time. Yikes. I didn’t know much about Pokemon Stadium, but looks like I was better off missing it. Informative review, thank you. There was a time in which Pokémon Stadium was worth buying, but that ship sailed long ago. It’s a bit different from most games I’ve failed because I legitimately can’t come up with a reason as to why someone should play it. Glad you liked the review! It wasn’t really obvious until a few years had passed, but Pokémon Stadium really didn’t have any legs to stand on in the long term. I myself had a lot of fun playing it with friends back in the day, but yeah, the Game Boy games are superior efforts.